U.S. Representative Dan Kildee arrived at Bishop Airport on Air Force One with President Barack Obama. 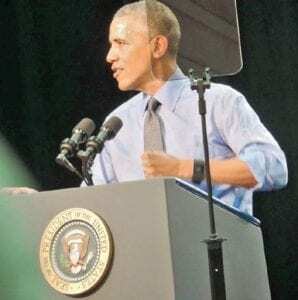 With that request, during remarks at Flint’s Northwestern High School, President Barack Obama sipped from his second glass of filtered water during his one-day visit to Flint for a firsthand look at the city’s ongoing poisoned water crisis. Drinking the water to demonstrate that filtered water is safe for most Flint residents to drink was one of several points the President stressed. A second important message is to make sure that every child in Flint who has consumed the water get tested for lead poisoning, he said. President Obama spoke to a crowd of more than 1,100 people at Flint Northwestern High School. He also met privately with a group of residents to talk about their issues with Flint’s tainted water supply. His third key point was that Flint’s children will be fine in the long term. Besides testing, steps already have been taken to provide nutritious foods, medical care and educational programming to mitigate long-term effects of lead poisoning. President Obama cautioned that replacing Flint’s corrosive water pipes will take time, six months or longer. He said he understood residents’ anger but asked that they channel that anger into working together to solve problems. He said he was committed to working with state and local leaders to see that the water problem gets fixed. “I’ve got your back,’’ he said. Michigan Governor Rick Snyder, who addressed the crowd before President Obama was booed so loudly that his remarks could barely be heard. Flint Mayor Karen Weaver, Congressman Dan Kildee and Senator Debbie Stabenow also addressed the crowd. Gov. Snyder and Mayor Weaver met President Obama’s plane when it landed at Bishop Airport and rode with him to his first stop at the Food Bank of Eastern Michigan where he received a briefing on the response to Flint’s water crisis from federal officials and members of the United Command group. The President also took part in a neighborhood roundtable discussion with affected Flint residents and met eightyear old Mari Copeny, aka “Little Miss Flint’’ whose letter asking to meet him initiated his visit to Flint. President Obama said called Flint’s water crisis “a manmade disaster” that he hopes begins a national conversation about what needs to be done to invest in future generations.